Via original manuscript pieces such as letters, journals, maps, official documents and publications, the exhibition will explore the causes, reactions, and responses of the American Civil War. “Treasures from the Vault” uses various perspectives and categories to achieve a broader understanding of the conflict that divided the fledgling Unites States. Artifacts illuminating slavery, emancipation, Abraham Lincoln, his Cabinet, and his assassination, the armies of both sides, the Union navy, and the difficulties faced post-war are on display. All materials are selected from collections held in the Howard Gotlieb Archival Research Center. Among the collections involved, the Military Historical Society of Massachusetts and the First Corps of Cadets present a close view of the part Massachusetts played in the conflict. “The American Civil War: Treasures from the Vault” will be on display through August 2013 in the Richards-Frost Room on the first floor of Mugar Memorial Library at 771 Commonwealth Avenue. The room is open Monday-Friday from 9 am – 4:30 pm. This event is free and open to the public. For more information, contact the Gotlieb Center at (617) 353-3696 or archives@bu.edu. Honoring Alumnus Martin Luther King, Jr.
On Martin Luther King, Jr. Day, Boston University will celebrate the life and legacy of Martin Luther King, Jr., who became “Dr. King” by earning a Ph.D. in systematic theology at BU in 1955. The University’s annual ceremony is one of the largest and oldest in the City of Boston, routinely drawing over 1,000 attendees from throughout the community. On January 21, the University will hold several events in honor of Dr.King. The Dean of Students and Howard Thurman Center present Lyrics. This year’s event will reflect on the power of words in many forms. University faculty, staff and students will present spoken word, short talks and dramatic pieces on how words in all of their forms have touched civil rights and how Dr. King’s words have left a legacy that touches our everyday lives. The cast of the Underground Railway Theatre’s staging of Katori Hall’s The Mountaintop will present a scene from the play, and Herbert Jones will provide dramatic performances and music. For more information about this event, contact Kat Hasenauer Cornetta in the Dean of Students Office at 617-353-4126 or katcorn@bu.edu. The Howard Gotlieb Archival Research Center will host director, producer and Academy Award Winning-actor Forest Whitaker as the speaker for its fourth Martin Luther King, Jr. Leadership Lecture. Whitaker will be invested as a Martin Luther King, Jr. Fellow. The Gotlieb Center is the repository of Mr. Whitaker’s personal archive and an exhibition of his material will be on display. For more information about this event, contact the Gotlieb Center at 617-353-3696 or archives@bu.edu. Learn about the fascinating life and career of world-renowned culinary master Jacques Pépin when the chef visits BU on December 5 for a reception, book signing and talk. During the event, part of the Friends Speaker Series hosted by The Friends of the Howard Gotlieb Archival Research Center, Pépin will reflect on his career as a famed chef and will sign copies of his newly published book, Jacques Pépin’s New Complete Techniques. Guests are also welcome to browse an exhibition of selections from the chef’s archive. In addition to being an internationally recognized chef, Pépin has also worked as the host of acclaimed and popular cooking programs on public television and as a respected instructor, prolific author and gifted artist. Pépin currently hosts public television series, “Essential Pépin,” and has previously hosted “Jacques Pépin: Fast Food My Way” and “Jacques Pépin: More Fast Food My Way.” A close friend to Julia Child, Pépin co-starred in the 1999 PBS series “Julia and Jacques Cooking at Home,” which won a Daytime Emmy in 2001. A former columnist for The New York Times, Pépin writes a quarterly column for Food & Wine and is a faculty member here at Boston University. The event will begin at 6 p.m. in the Metcalf Ballroom, located on the second floor of the George Sherman Union, 775 Commonwealth Avenue. The event is $25 for the public and free for BU students. For more information, contact Christopher Gately at archives@bu.edu or (617) 353-3696. Join Boston University’s Howard Gotlieb Archival Research Center, in collaboration with the School of Music and College of Fine Arts, for a memorable night with Philip Gossett, one of the world’s foremost experts on Italian opera. 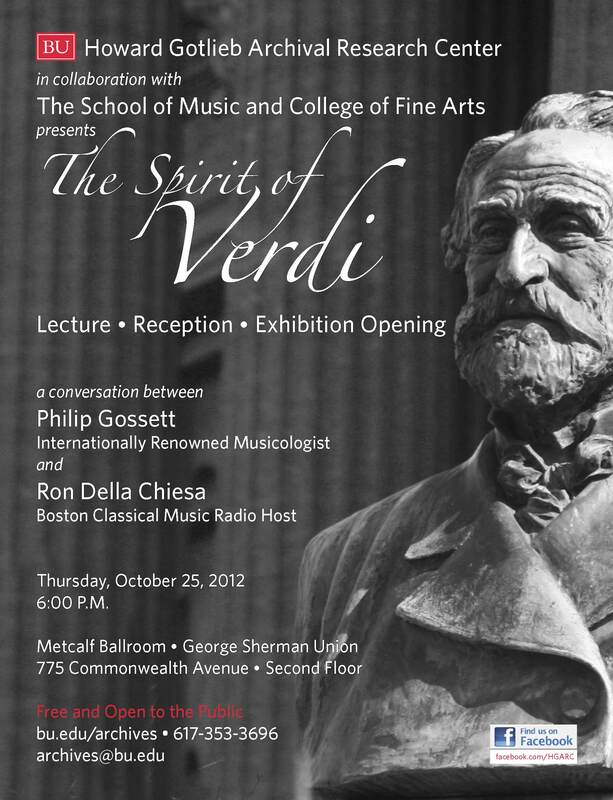 The Spirit of Verdi will take place on Thursday, October 25 at 6PM in the Metcalf Ballroom of The George Sherman Union. This event is free and open to the public. Boston radio icon Ron Della Chiesa will moderate the evening which is part of a yearlong exploration and celebration of the work of Giuseppe Verdi in anticipation of the bicentennial of the composer’s birth. Contact the Howard Gotlieb Archival Research Center at 617-353-3696; archives@bu.edu. It’s a new era for presidential campaigns. If you are interested in the influence of Super PACS and social media in the 2012 presidential election, join your friends at Boston University’s Howard Gotlieb Archival Research Center for a panel discussion with some of Boston’s most notable media personalities including Republican analyst and author Todd Domke; Boston Herald columnist and WTKK-FM host Margery Eagan; WGBH Radio News senior reporter Phillip Martin; and Boston Globe columnist Joan Vennochi. 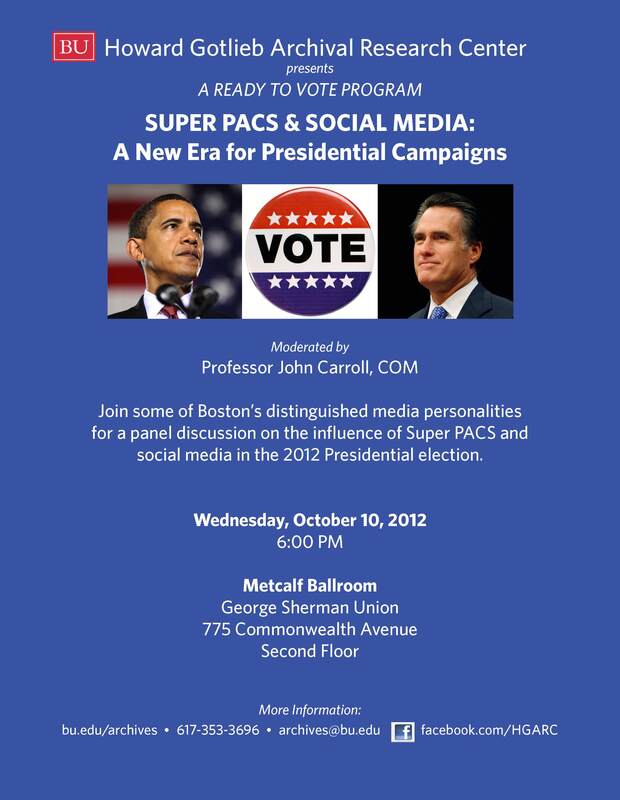 Super PACS & Social Media: A New Era for Presidential Campaigns will take place on Wednesday, October 17 at 6 PM in the Metcalf Ballroom of The George Sherman Union. This event is free and open to the public. For more information, contact Howard Gotlieb Archival Research Center at 617-353-3696; archives@bu.edu. The Friends of the Howard Gotlieb Archival Research Center at Boston University will host Pulitzer Prize-winning journalist, producer, correspondent and author Hedrick Smith for a reception and book signing on Thursday, October 4th at 6:00 PM in Metcalf Hall. 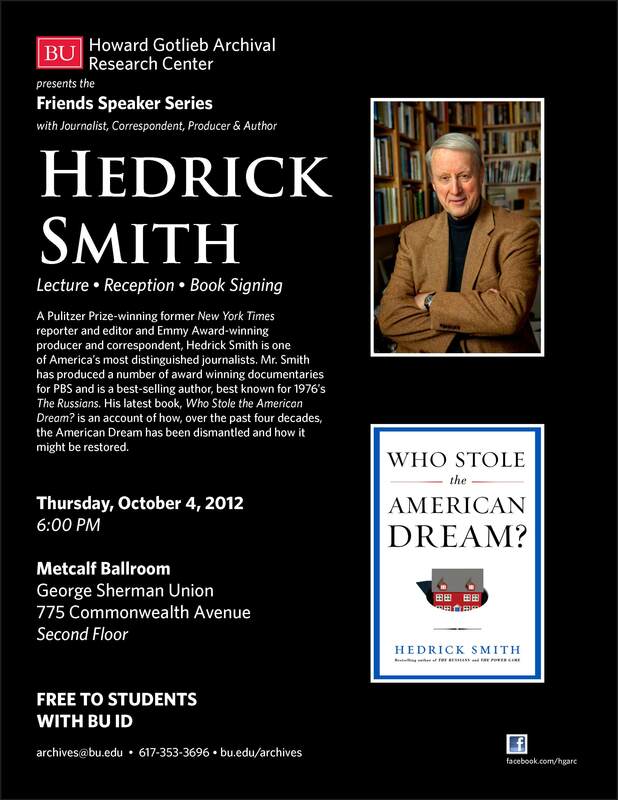 Mr. Smith will discuss his latest book Who Stole the American Dream? (September, 2012), an account of how, over the past four decades, the American Dream has been dismantled and how it might be restored. Mr. Smith also has been recognized for producing a number of award-winning documentaries for PBS and is a best-selling author, best known for 1976’s The Russians. This event is free for BU students. Tickets for the general public are available at the door for $25.00. Tonight The Nursing Archives Associates at Boston University and the Boston University Alumni Association will host their annual meeting with guest speaker Dr. Jeanette Ives Erickson, (RN, DNP, FAAN) for her talk The Evolution and Revolution in Patient Care. A graduate of Boston University Graduate School of Nursing, Dr. Erickson is Senior Vice President for Patient Care and Chief Nurse at Massachusetts General Hospital. The event will also feature the inaugural presentation of the Nursing Archives Associates Mary Ann Garrigan Award to honor outstanding professional achievement in nursing. The meeting will take place in the first floor auditorium of the School of Management at 5:30 p.m. The History of Nursing Archives contains an extensive book collection, as well as the personal and professional papers of nursing leaders; records of educational institutions, public health groups, and nursing organizations; and histories of various American and foreign schools of nursing. The books and manuscripts in the History of nursing Archives document the evolution and contribution of the nursing profession in the fields of public health and military history. On Wednesday, April 18th, award-winning journalist, novelist, essayist, editor and educator Pete Hamill will be hosted by the The Friends of the Libraries at Boston University to give the nineteenth Abraham S. Burack Lecture. Mr. Hamill, who has won several journalism and literary awards and is a Distinguished Writer in Residence at the Arthur L. Carter Journalism Institute at New York University, will give a lecture reflecting on his life and career and will also be available to sign books. Mr. Hamill’s papers are part of the Howard Gotlieb Archival Research Center at Boston University. Prizes for the Lawrence G. Blackmon Student Book Collecting Contest will be awarded preceding the lecture. This event is free to students with a BU ID and $25 for non-members and guests. The talk begins at 6:00 p.m. in Metcalf Hall. A cocktail reception will follow. The Howard Gotlieb Archival Research Center invites all current full-time University students to participate in the Lawrence G. Blackmon Book Collecting Contest. This contest awards students for themed book collections of 50 titles or fewer. Cash prizes will be awarded for 1st-4th place, Emerging Collectors title, and Best Essay. This contest is sponsored by The Friends of the Libraries at Boston University and was endowed by Lawrence Blackmon in 1984. Entries must be delivered to the HGARC office by 5 p.m. on March 26, 2012.